When I met Bjorn Winblad at a Rosenthal Event in DCOTA back in the '80's I was amazed by this legendary artist's sense of humour and kindness. He signed some porcelain items for me with a golden magic marker and spoke about his love of color in design. 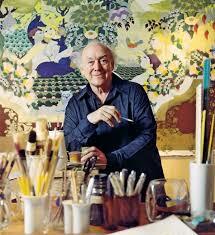 Mr. Winblad was born in Denmark in 1918 in Copenhagen, Denmark and was one of the principal designers for the Rosenthal Porcelain Company, creating colorful round faced people surrounded in floral and foliate designs with an abundance of color. He died in 2006 also in Denmark.